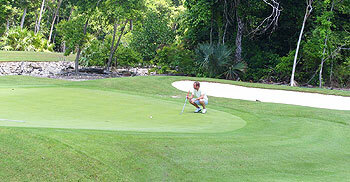 Playa Paraiso Golf Club is located at the Riviera Maya on Mexico’s Caribbean coast, around 30 miles south of Cancun. The golf course opened for play in 2005 and was designed by P.B. (Paul Burke) Dye, the youngest son of Pete and Alice Dye, and it’s gradually climbing the rankings. The all-inclusive Iberostar Playa Paraiso competes with many luxury resorts along this coastline but the recent addition of this golf course, along with the Greg Norman-designed El Camaleón at the Fairmont Mayakoba, means that the intrepid travelling golfer can kill two top-notch Mexican courses with one stone. 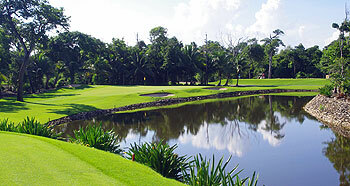 Measuring 6,800 yards from the back tees, Playa Paraiso is not going to beat you up too badly for length but it’s a technically challenging course that has hosted the Canadian Tour Riviera Maya Open, so don’t expect an easy walk in the Mayan jungle. With a number of holes routed through thick forest, the going can be rather tight at times and the smallish, undulating and well-bunkered greens place a premium on accuracy. At times the rough can be brutal so use the driver with care and hope there’s not too much wind blowing from the east. I played Playa Paraiso twice back in July 2010. I found it very enjoyable and well worth a visit. The course has been constructed with many undulations from what is a flat landscape cut out from the vegetation together with some water features and waste bunkers. The course was a fair test although concentration is needed on all of the holes if you can avoid the tight drives and hollows then a well thought out approach shot should leave a good birdie opportunity or par, however the greens are fast and have many slopes which can make a three put very easy!